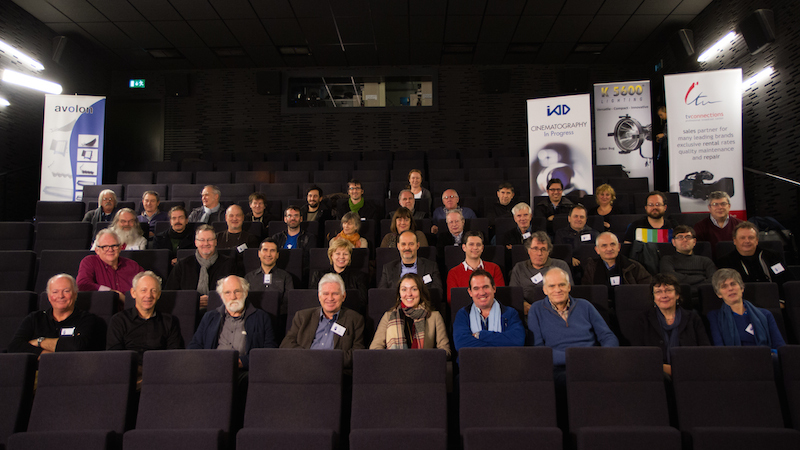 In November 2014, the Institut des Arts de Diffusion (IAD) hosted an international conference in collaboration with the Belgian Society of Cinematographers (SBC) and IMAGO, about the influence of new technology on the methods of teaching cinematography at film schools. 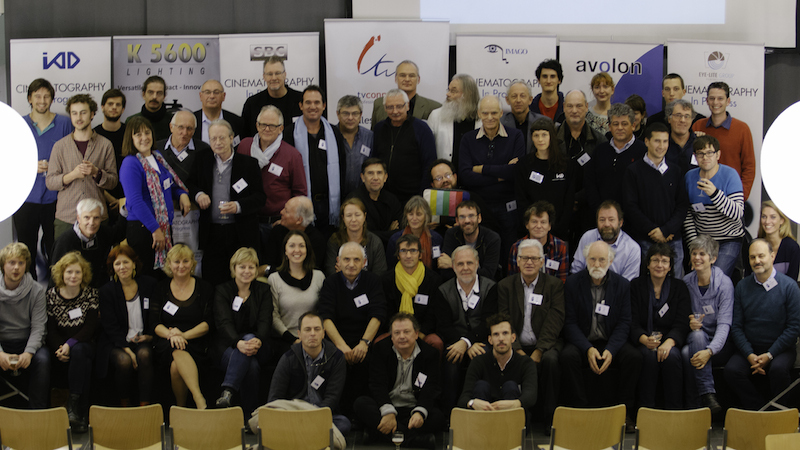 The aim was to gather professors of cinematography working as professional cinematographers for an open dialogue on the challenges of the teaching of aspiring cinematographers. Five different workshops were organized. In the first workshop, attendees discussed whether film cameras should still be used while teaching, what to do with DSLRs and which aspects of camera technology should be taught at film schools. 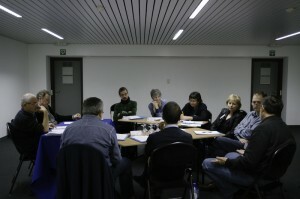 The second workshop dealt with the digital workflow. Participants of the workshop all argued that cinematographers have to be in full control of their images, but questioned how teachers can form competent team-leaders out of cinematography students. In the workshop, the focus was put on teaching the workflow, training the students’ eyes and the importance of a complete camera crew. 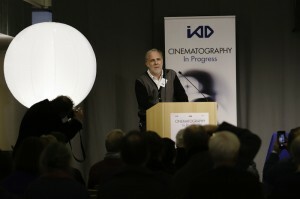 The central theme of the third workshop was color grading. 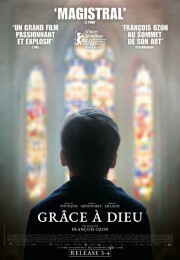 Color grading is part of the cinematographer’s responsibilities. However, nowadays editors seem to be taking over this responsibility. How should the complexities of color grading be taught so that aspiring cinematographers are ready to take over on their duties again? In the fourth workshop, the focal point was the teaching of visual effects. While not necessarily part of the cinematographer’s responsibilities, visual effects are an inevitable part within filmmaking. It is therefore important that cinematographers have an understanding of all the available visual effects. They should also learn to collaborate with the animators (CGI specialists) and other people who are in control of the visual effects of a film. The final workshop was on the topic of monitors. Although monitors are important and useful tools on set, they have shortcomings and are not always the right reference. Raising awareness about these shortcomings and teaching students how to correctly work with monitors, as well as with other tools for controlling the image, is a crucial task of a cinematography teacher. A detailed summary of the discussion during the workshops is provided on the following pages. Some remarkable points that were raised during the joint discussions after each report are also summarized. Learning about camera technology is obviously a crucial part of the education of aspiring cinematographers. Yet, it is not easy to determine which aspects of camera technology should be taught and how film cameras and DSLRs should be incorporated in the teaching. Teaching students the basic principles of digital camera was deemed more important than teaching their specific tools, because the basic principles or functions of a camera are generally stabile. Put differently, they will not progress much during the following years, whereas specific tools can more easily become outdated. Basic principles include sensors, recording, digitalization, reception for bandwidth, encoding and DSP (digital signal processing). In addition, the workflow can be expanded from image acquisition to projection, including color grading and dailies. Another idea uttered during the workshop was to introduce a new job function during the education of future DOPs, namely that of the technological manager. This is a teaching method that already exists in Romania and it entails that the person appointed is responsible for all the technical decisions, from choosing the lenses to postproduction labs and color grading. The point of giving one person all of these responsibilities is that any future DOP should know about each and every step in the (technical) process. It was also agreed upon that film schools should continue teaching with film cameras, though only as long as this is financially feasible. Teaching with film cameras shows the students an interesting approach to cinematography and improves their sense of discipline. Yet, while film cameras are great to teach students discipline, they’re not the only option for that purpose. Discipline can also be taught by focusing on this aspect in different classes and on different levels. Shutting down a monitor, for example, is simply a matter of knowing where the button is to turn it off. In this sense, while film cameras are great tools with many possibilities, they’re usually not the only option for teaching certain aspects of cinematography. When using DSLRs in a film school, teachers should stress that these cameras are merely an economical solution for teaching framing, focus pulling, light setting, and for experimenting. Using DSLRs to teach certainly has its benefits, as it reveals the shortcomings of DSLRs. Consequently, students will appreciate working with professional tools a lot more. Brussels 16 mm cameras are frequently rented from the rental department, proving just how eager students still are to work with film cameras. Clearly, the assumption that students nowadays only want to work with the latest technological tools is false. Contrary to the opinions in favor of film cameras, it was also stated during the joint discussion that film is on the verge of extinction! Moreover, cinematographers are unlikely able to convince a director and the rest of the production of a movie to shoot on film, which leads to question the value of teaching with film cameras. In other words, what is the use of teaching aspiring cinematographers how to work with film cameras if the chances that they’ll actually shoot on film during their careers are exceedingly small? Perhaps, as was also argued, because film cameras are useful learning tools for other aspects of cinematography. Film cameras allow less margin for errors than digital cameras; students have to think more before they take an action. Film cameras also clearly reveal the borders between looking for the darkest details in the black areas of the picture and keeping some detail in the overexposed areas. Besides, film cameras are an important part of the history of film and cinematography and, as a result, it is only logical that they be included in the student’s curriculum one way or another. A final remark that came up during the discussion was that when teaching film cameras, it is important to teach the whole workflow and not just the part of shooting on film. Students are not always aware of how working with film differs from working digitally, so they sometimes have wrong expectations. Professors should thereby closely follow up the process, and deal with the expectations of the students and teach them about all the different aspects of working with film cameras. The workshop on digital workflow discussed how teachers of cinematography can form great team-leaders on film sets, fully in control of the image. The participants focused on different topics such as teaching the eye of the students, teaching about getting the right exposure, the size of the camera crew and the importance of looking at rushes/dailies. the basic fundamentals of each step of the workflow so that aspiring cinematographers have sufficient knowledge in order to control any workflow they’ll encounter in the industry. Besides, students have to learn that a workflow does not only consist of working with the camera, but also includes shooting, editing, postproduction and screening tools. In order for students to get familiar with workflows, they need to constantly test the different ones they encounter. Secondly, a lot of attention has to be dedicated to teaching the eye (to observe and to analyse). Students need references for creating their own images in their professional careers. Besides, while it is unsure how technology will continue to evolve, the human eye remains a stable reference. Students should learn to use their vision instead of relying on technology for creating innovative images. It is part of the teacher’s responsibility to help students develop their eye as much as possible. 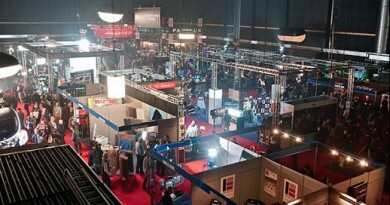 For financial reasons, current production companies try to reduce the size of the crew. The clapper loader, for example, is often dismissed from the crew. Yet he/she has the same tasks as before digital cameras were used, like assisting the focus puller in handling the camera equipment. Hence it is not a dismissible function at all. Film crews, nevertheless, must be as complete as possible in order to obtain the best result, with each member having a specific task, like in a classical crew. This mentality should be underlined by teachers in film schools. Moreover, during the workshop there was an overall agreement that with digital cameras the size of the crew should in fact increase instead of being reduced. Furthermore, there is a tendency to replace people of the crew with less competent people who only have superficial knowledge of what they’re expected to do. This is a bad evolution. The second assistant, for instance, can’t be replaced by a trainee or such. The same goes for the data manager. It is also not possible for someone to do both of these jobs. The Digital Imaging Technician (DIT) is also a crucial function for controlling all the different technical aspects, from shooting the images on set to controlling them in postproduction, while following the instructions of the cinematographer. For big productions using more than one camera, a DIT on set is absolutely necessary. It is impossible for the focus puller or the cinematographer to control the image while, at the same, time performing their primary tasks, respectively focusing and lighting, and maybe operating. This function should receive more attention at film schools. Should color grading be part of the cinematographer’s education or does it belong to postproduction? Color grading seems to be gradually taken over by the Editing Department, which is not acceptable because the cinematographer must be in control of the image from the beginning to the end. 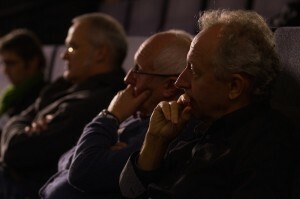 Color grading has to remain part of the cinematographer’s responsibility, so the techniques and skills necessary for color grading must be taught to students of cinematography. This topic will be further discussed in chapter 3. First of all, there’s a great deal of concern for teaching students about getting the right exposure. Using a grey scale and a light meter is a must for obtaining correct exposures in cinematography classes. Before digital cameras, light meters were almost always used for that purpose. Nowadays, the light meter, as well as any other measurement tool, is too often avoided. Light meters are not only useful to check exposures, but are also extremely useful for controlling contrasts. The electronic measurement tools available in cameras can’t sufficiently evaluate the level of contrast, so students need to learn about the best tools. The control of contrast is something teachers should really focus on with simple exercises. There seems to be a growing mentality of fixing the contrast in postproduction, which has to change. Students have to understand the importance of obtaining the correct exposure and continuity between shots in the same scene while shooting, instead of fixing everything in post. Secondly, the knowledge on about film negative is disappearing. The main reason for that is the rapid disappearance of film labs, which obviously challenges teaching with this format. Yet, teaching with film cameras and using the classic photochemical process is still a good tool to make students understand aspects like exposure, control of lighting and most of all discipline, as was already discussed. This seems to be lost with the use of the inexpensive digital format. Teaching with film is still important for getting a full understanding of exposure. 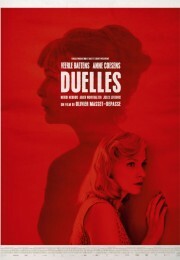 In film, the original image was the exposed negative created by the director of photography. In digital, one of the main questions is: where is the original image all along the workflow? A film negative is concrete, but in digital it is not as tangible. It appears more and more important to answer this question thoroughly, to preserve t image quality and its significance. Thirdly, the habit of watching rushes at the end of the day seems to be lost. Not only amongst students, but on a professional level as well. Digital formats don’t require the use of a lab process. Because of this, the expectations of looking at the results that came from the lab is gone. Checking the shots with the different departments involved in the making of the movie was useful, though. Without the habit of watching rushes/dailies it is no longer possible to get all the several departments involved in creating a film and to correct or improve the results of each department. Looking at rushes/dailies was particularly useful for the communication between the cinematographer and director. Finally, teachers should not neglect the philosophical aspect of cinematography. Images contain meaning and subtle messages. The image is therefore a valid vehicle for telling stories. It is not only an object of art, but it is an important historical document for the present and future generations as well. Students should be aware of this and it is the teacher’s responsibility to raise awareness about this. A participant stated during the discussion that there is a shortage of art lessons that go in depth and in which teachers and students actually dissect paintings, pictures and other images. Such classes would be useful in order to fully educate the eye of the students and to create references. Many schools do offer a course on the history of art, but these are usually a mere historical overview. The class should go more in depth, and show students how to analyze these paintings and how these analyses are useful for their own future work. Someone then argued that teachers of cinematography should not rely on art history teachers and have to show their students useful images too, for example, from Caravaggio, Hopper, and so on. Artists who looked at light, way before cinematographers, and who did something with it. In the paintings students can see what these artists did with the use of light and what they themselves can do with light, in a different medium of course. Students need references in order to form their eye. What the art teacher teaches the students can’t be controlled completely, so teachers of cinematography have to take some responsibility as well. They can even go beyond simply showing images to their students by giving assignments that challenge students to creatively work with a certain painting or image. 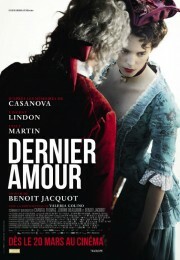 For example, let them create a short film based on a painting with interesting lighting. Also suggested during the discussions were courses on the history of cinematography and elocution classes. The latter may seem strange, but as a cinematographer needs be able to communicate well on set, it is actually useful to learn proper speaking skills. Unrelated to the discussion on art courses, someone pointed out that when designing a workflow, it is important to keep the final destination of the film in mind, for example the internet, TV or DCP (theatrical distribution). Also useful is to have a workflow team in the film school that designs workflows and is able to answer possible questions from aspiring cinematographers about workflows. Cinematographers are responsible for grading. However, this seems to become more and more the responsibility of editors. Teaching cinematographers about color grading is crucial so that they can take on their responsibility. Teaching color grading is not a sinecure, but the workshop resulted in a number of suggestions for teachers of cinematography. Students that graduate as DOPs should first of all have a good understanding of workflow, as this is one of the first aspects of the industry that they will have to deal with as a camera assistant or grading assistant, or anything else. Workflow will evolve quickly, but having this basic knowledge will allow them to adapt to future changes more easily. Secondly, students that want to specialize in grading should be confronted with the technical and creative responsibilities of the DOP. Thirdly, they should have adequate knowledge of the possibilities of grading systems, starting with Da Vinci and moving on to more current systems, in other words a teaching method based on technological development. Finally, they should also master the language (vocabulary) used during the grading process. Don’t leave grading in the hands of the Editing Department, even though that is where the computers usually are. Grading should already be introduced to the students during their first camera test, usually in the second year of their studies. In doing so, students will understand that grading is part of the workflow, hence part of their responsibilities. Grading is also a great pedagogical tool for cognitive analyses of cinematographic works, especially at the beginning of the training. Students should first learn to light and expose using linear contrast curves. In other words, limit their options. Begin with teaching in REC709, and then move on to log curves (or to raw, but only if you have sufficient financial means…). If they grade afterwards, it is the best that they only grade in primary colors. By limiting their color grading students will have to be more precise on set. Also, they will appreciate the range that they learn later in the course. Even though experimenting with software and tools is good, students should work with the basics before moving on to more complex processes and tools. Another suggestion is to organize conferences with a senior grader. S/he can talk about the job and experiences related to grading and can bring examples. It is important that students learn about the particular vocabulary used by graders and real examples are a great way to introduce the language of grading to the students. Moreover, it would be helpful for them if they could grade their images together with a professional grader. It is also important to include directors into the process of grading at film schools. Learning about color grading at school is very much about learning how to communicate with directors, editors and graders. Students should also keep in mind what their intentions were before shooting. The final look of a film should be conceived before filming, so someone has to help students to stay on track. Their project should correspond the ideas they previously had indicated on their mood boards. Of course, it is impossible to form professional graders at film schools. That would require a new section or an additional module, maybe even a master. However, teaching aspiring directors of photography is already challenging enough for film schools. For beginners, it is probably easier to teach the management of the grading software with pictures that they haven’t shot themselves, as they are usually too emotionally involved with their own images. Students of cinematography, who grade their images themselves, should be accompanied by another student or professor not directly involved with the shooting. Otherwise all their energy will be used to correct what they think they have not achieved during shooting. A suggestion during the discussion after the report was to let first-time graders grade on images from that were shot by other students during their first year. This is an experiment that can lead to great insights for both students and teachers. During the workshop on visual effects (VFX) it was brought to light that while VFX are increasingly present in all sorts of narrative and production models, the topic is still underrepresented at most film schools. The participants tried to determine how VFX should be incorporated in the student’s curriculum. a department for Animation should encourage collaboration with the Film Department. It is, however, impossible for aspiring cinematographers and directors to learn every aspect of VFX. The emphasis should lay on teaching cinematography in function of VFX and not VFX in postproduction. Some notions of this post-workflow process are essential for efficient collaborations between the different departments, but cinematographers are not required to have an in-depth knowledge of VFX in postproduction. Special effects and in-camera effects are still a big part of visual effects in general. As a result they should be taught in conjunction with VFX. In the industry 80% of the effects are special effects (SFX) shot on-set and 20% are visual (computer generated). This hierarchy should be represented in the student’s curriculum. Additionally, understanding the work of a coordinator of visual effects is key to improve the communication with both directors and cinematographers. The following learning techniques were suggested for teaching about VFX: Motion Control, Motion Capture, and especially techniques that involve using green screens. Green screens are already part of most students’ courses, but could be taught more elaborately if cinematography for VFX becomes a separate module in the student’s curriculum. In terms of the infrastructure, most participants of the workshop believed it is possible to to teach VFX with the materials that are already available at schools. Motion Control machinery and Motion Capture infrastructures are an additional option for teaching. However, MOCO and MOCAP are both extremely technical and, in this sense, not necessarily core values for the Art of Cinematography. In terms of the software that is required to teach VFX at film schools, there was no consensus formed during the discussions. The students from the Animation Department learn different software and film students can get some experience by collaborating with the students of animation. Software lighting, being more related to cinematography, can be taught by focusing on real lighting. Is it really necessary though, to teach aspiring cinematographers about VFX? The answer to this question is both yes and no. While accurate knowledge of green screens is crucial and should be incorporated in existing cinematography courses, courses on visual effects cinematography should be optional rather than obligated. These optional courses should incorporate MOCO and MOCAP, and bring the animation students together with film students for collaborative assignments. aspiring cinematographers with the necessary knowledge to be able to communicate with these people. Participants generally agreed that when teaching students of cinematography about VFX, the emphasis should lay on cinematography in function of visual effects. Part of this is learning how to collaborate effectively with other departments. If you work in a visual effects environment, there are so many different techniques and software, so most people over there are specialists. Understanding what a coordinator in visual effects does on set is crucial knowledge for future cinematographers. Many participants also agreed that the Department of Cinematography should work together with the Art Department and the Animation Department. Teach students about different techniques: camera effects (double effects), mechanical effects (compressed air), simple special effects on set, working with green screens, shooting miniature, visual effects and CGI. Also, raise awareness on the invisible effects that preoccupy up to 80% of all effects in current movies. It is important that students have a notion of all the possible techniques, and they should also know what specialists to turn to when they need a certain technique. Aspiring cinematographers and directors do not necessarily need to practice each technique, but a basic knowledge of all that is available is crucial when they begin working on a professional film set. The monitor is a technical tool for communication, but at the same time it is a social place, where people gather around to share their ideas and experiences. Monitors first came onto the film set in the form of video assists for film cameras, but they have stayed on set and evolved ever since. Students of cinematography should, in the first place, be taught to look at images, such as paintings, stills and film clips, and need to learn how analyze the content and the way the lighting is created. Young people are used to looking at screens, so it is almost unthinkable for them to not use a monitor. Yet, how can monitors serve as a reference tool for building and creating the light of an image? If not, what alternative can we offer students of cinematography? The light meter should remain the absolute reference for measuring the light. The light meter establishes a physical relation with the light in a 3D setting. One has to move to the lit place and physically observe how the lights hits the setting, check the direction and orientation of the projectors or sun and then get the necessary values. Monitors, on the other hand, are in 2D and can’t give an exact idea of where the light comes from. replicate, and it is the most reliable tool for pre-lighting, in the hands of the gaffer. When a light meter is not at hand, which seems to be the case with most young people who state that it is too expensive, a monitor with a wave form-vector scope (such as the Astro) is preferred to the one displaying only a histogram (not as easy to comprehend). After a couple years of experience, the eyes of the DOP will start serving as a light meter. This is truer today as cameras have a sensitivity similar to that of the human eye: what you see in the darkness is more or less what you get on the screen. But in shadows, it appears that the camera is even more sensitive, making it difficult to judge the richness or depth of blacks. We should also not forget that the max dynamic range of a monitor is seven stops. Monitors are great tools for teaching how to look at an image, how to calibrate correctly and how to use a reference picture. They are also effective for sharing impressions about framing while the camera is being operated. For example, monitors show if the camera operator has a good sense of movement. The monitor is therefore a wonderful tool for creating camera movements during rehearsals. However, the energy should be spent behind the camera and not behind the monitor. For directors, there is usually a movement towards the camera because now there is a monitor on the camera. This helps them to be closer to the camera operator and actors. We have to teach students to be careful as the RAW image often looks too full of detail and always “fits” because the dynamic range is so great. Also, when the DOP is operating, the gaffer, together with the DIT, should watch the monitor to check for lighting and levels. 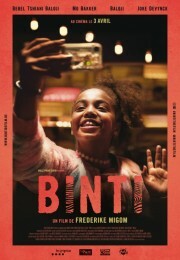 The picture should remain as coherent as possible, since the quality of the picture is responsible for maintaining a confident relationship between the producer, the director, the DOP and other members of the crew. This relationship of trust is important, but it is sometimes lost when there is a lack of reliable images and information. Monitors are everywhere: on the camera, by HF in the director’s hands, at the ‘video village’, for viewing dailies (on smartphones, tablets, pc’s to 2k projectors and TV sets), at the offline station, during the grading process and finally in the theatre. It is therefore crucial that crewmembers look at the same monitor when discussing a particular image. At times it is possible that certain decisions on set are taken while looking at a bad monitor, which is dangerous. Thereby, the final stage, that is the grading station and reference projector or monitor – for TV, should always be used as a final back up. LUTs (look-up tables) are undeniably necessary. It is quite complicated to get something reliable for the whole workflow, so generally it is so that when REC 709 (standard HDTV image) looks fine, chances are that it will look good in the final stage as well. When it is difficult to provide a decent quality, one could always cheat the settings of the monitor. If we want to play with several LUTs, a DIT is inevitable. However, then it becomes a problem for the production, where it is all about time and money. The quality of a picture during the on-set monitoring and offline editing requires special attention. Namely because after a few weeks the director will likely become accustomed to the quality s/he is receiving on the screen. The director might even begin to like that quality. To avoid this, why not use color charts and grey wedges at the beginning of each sequence? These are well known absolute references. The viewfinder (another monitor) could also be a great tool when used in B/W, because it allows a better vision of the contrast range. HF monitors, carried around the neck of the directors, are small, so the body language and face mimic of the actors are difficult to perceive. Watching such a small screen often results into bigger close ups, different rhythms and pace in the movement, for example pans on a landscape, and false interpretation of the body language. Clearly, the size of a monitor has a huge influence on the final images and directors of photography should always remember what size monitor they’re using. Monitors are tools with certain qualities, but also with certain defaults and limits. The camera department is responsible for providing students with adequate equipment that both the creative and the producer on set are comfortable using. The pre-production is a key moment to establish a relation of confidence between the crew and the monitoring. Students should also be taught how to calibrate a monitor with the available tools. They should learn that calibration on set can be a dangerous process with the possibility of wrong interpretations. – Proper use of a light meter to shape and design the lighting on set. – Proper use of a vector scope and waveform (reading of a histogram). – Calibration of the monitors to give a coherent viewing system on set. – Use and proper installation of a monitoring system on set. – Practical use and understanding of the workflow. – Practical use and understanding of the LUTs. One important aspect raised during the discussions was to connect the monitoring to the cameras, since depending on the quality of the internal process the camera can’t have the same image on the displays. Students should be trained to know how the camera displays a certain image. Students also need to be taught how to calibrate the different monitors on the set. Wireless monitors display a certain image and contrast, so they are not a reference. Usually the director has a wireless monitor, which is completely different than a connected monitor. Monitoring is part of the job and aspiring cinematographers have to accept that. Everyone agreed that teachers should teach students how to correctly use a light meter. Another reflection was that many monitors have a histogram feature that is difficult to interpret. Students should be warned about the possible mistakes they can make when interpreting them. 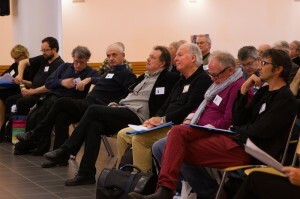 Although the workshops were based around different themes and a consensus was almost never conceived, some broader conclusions can be drawn from the conference. 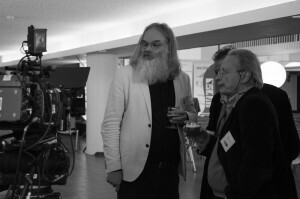 In general, participants agreed that one of the main aims for teachers of cinematography should be to prepare students for their future professional careers. When graduating, they should understand what each person on set does and they should be able to communicate adequately with each member of the crew in order to get a great final result. They also have to be able to take on their responsibility and be in full control of the images that are created. Teaching students about workflow, visual effects and color grading is one way to prepare them properly for the industry. 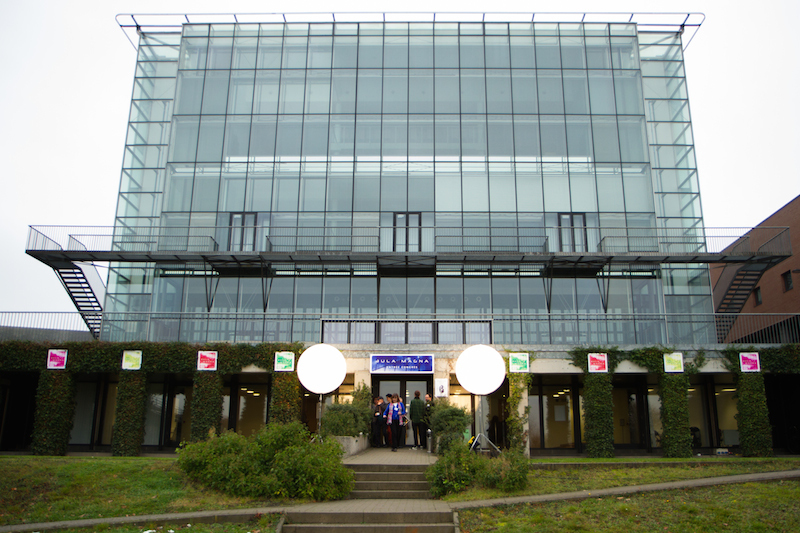 Giving students assignments that require collaboration with other departments available at the school, for example the Department of Animation, is a good option for teaching. These collaborations will not only allow them to practice their communication skills and team work, but will also teach them a lot about the different functions on set and their responsibilities and possibilities. Another important aspect of teaching aspiring cinematographers is to limit beginning students, for example when teaching color grading. The large amount of different software and tools can be overwhelming at first. When teaching camera technology a similar approach was preferred. Focus on teaching the basic principles first, since those are more stable than specifics. The artistic side of cinematography should not be neglected. While the main aim is preparing students for the industry, teachers should develop their creativity and eye by providing sufficient references and by giving them assignments that stimulate their creative side. Students should analyze paintings and other images in order to form their eye. This can be encouraged during courses on art history, but teachers of cinematography should do this as well. Aspiring cinematographers need to learn the rules and need to learn how to look so that they can play with these rules and break them afterwards. In other words, they should learn how to look, but at the same time be able to put aside what they’ve learned. Technology is constantly changing and the film industry is highly influenced by technological revolutions and the digitalization of the world. Cinematography is constantly developing, so it is only logical that the education of cinematography adapts to these evolutions. Having a constant and open dialogue between teachers of cinematography will improve the quality of the education offered at film schools. As said, most of the participants were professional cinematographers that teach cinematography at film schools. Being professionals, they know all about the professional industry, in which their students once will end up working. Their knowledge is crucial to form the next generation of proficient cinematographers. This report was a joint work of Marc De Backer, Lucas Jodogne, Louis-Philippe Capelle, Willy Stassen, Ella Van den Hove and Dylan Belgrado.